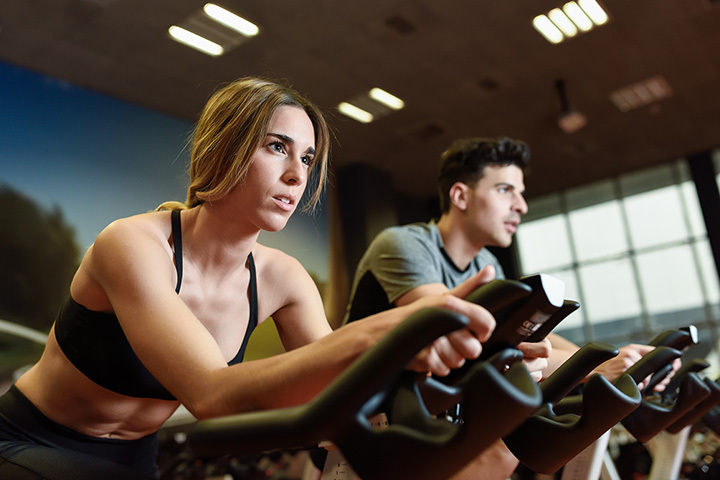 Spin classes are a great way to stay fit and to connect with people over a common passion. This stationary cycling phenomenon has been sweeping the nation for years and in Michigan, it’s no different. From fitness studios in St. Joseph to athletic clubs in Kalamazoo, here are the best spin classes in Michigan. St. Joseph's Maddog 5/1 offers an almost staggering array of fitness classes, from weights to something called “Ballerina Boot Camp” which was constructed by a ballerina and a Naval officer. Spin classes, however, take center stage, with offerings ranging from the informal “joy ryde” to much harder material. There's even one course, the “Bike RR Barre,” that combines spin with barre to give both cardio and weight training at the same time. With locations in Lansing and Grand Rapids, FLEXcity works almost on a modular level. Its classes run 56 minutes each and are designed to burn between 500 and 900 calories per go. Spin classes are part of the roster here, along with barre, TRX, BOSU and more to help get the calories burning. Moreover, since the classes are split into three components, the end result helps build not only cardio, but also strength training and just a side of flexibility with that. For those who like the thought of keeping their spin operations in a group, Kalamazoo Athletic Club in Kalamazoo will have just what you want in mind. Group Cycle classes take place twice a week, and that's just where things start. Check out highly varied options like Circuit and Total Body Toning. CycleBar in Royal Oak has recently undergone some changes. Originally called Go Cycle, it changed its name to better reflect its customer base and improve its branding. Everything that made Go Cycle worth considering, though, has followed over into CycleBar, as evidenced by its overall stance. The company takes particular care to call in new patrons, including special rates like three classes for $29. It's also the very first dedicated cycling studio franchise company, and CycleBar locations have been seen cropping up as far afield as Cincinnati, Ohio. Saline's RydeOn Cycling Studio recently celebrated a new connection with Delirium Fitness, which is good news for anyone looking for the best in Michigan spin classes. Not only does RydeOn offer a nice range of same, but it offers them at several price points to allow you to better tailor your workout to your budget. Whether you want an early-morning option to help you wake up or you're looking for a high-energy experience that perks you up for the day ahead, RydeOn has the answer. Ypsilanti's Ypsi Studio is a great option for the beginning spin class student. Why? Because it actually offers an introductory class specifically for those who have never taken an indoor cycling class. It turns out that spin classes can be fairly complex, complete with their own lingo, and with Ypsi Studio's Intro to Cycling, you'll have a much better perspective on the classes and give yourself a better overall experience in the process. Naturally, there's plenty else awaiting here, and with multi-class, unlimited, and drop-in passes available, you'll be able to set yourself up just as you'd like. Spin classes at this particular branch of Yen Yoga will offer either straight cycling or cycling with an additional component. Whether it's cycling and strength training, or cycling and sculpting, you can kill two birds with one stone here or just stick to taking out that one single bird. Plain old strength training and some dance-inspired courses are also on hand here to round out the field. A top-rated Michigan gym, Saginaw's Seung-Ni Fit Club offers a wide range of activities from strength training to kickboxing. The spin classes, however, are what you came for. Seung-Ni suggests that those who take these classes can burn up to 800 calories in the space of 45 minutes thanks to a range of activities from sprints to climbs and beyond, making this a great way to deliver some real value to your workout. Just to top it off, the workout also delivers variety and entertainment value, so you're better likely to stick with it.